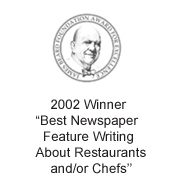 That’s the fun title of the newest cookbook (Andrews McMeel) by the ever prolific New York cooking instructor, Rick Rogers, of which I recently received a review copy. But it might also very well be a mantra we would all shout happily from the rafters. Come on, say it with me now: I. LOVE. 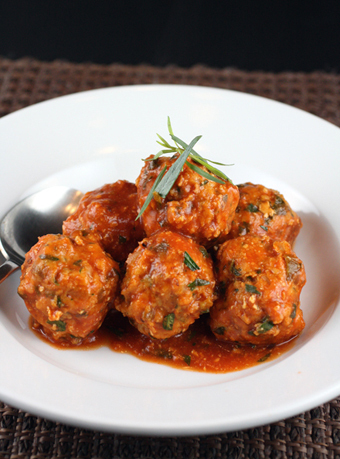 Meatballs. If that doesn’t put a big smile on your face, I don’t know what will. 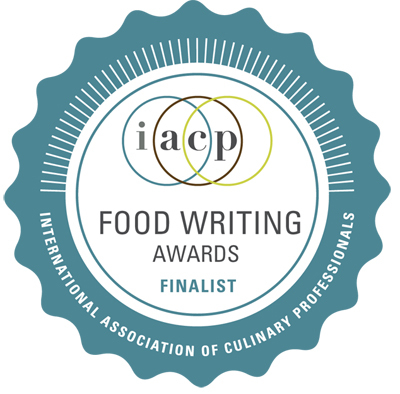 I gravitated to the “Ziti with Sausage Meatballs and Broccolini.” The meatballs are actually made from ground pork and sweet Italian sausages that have been removed from their casings. 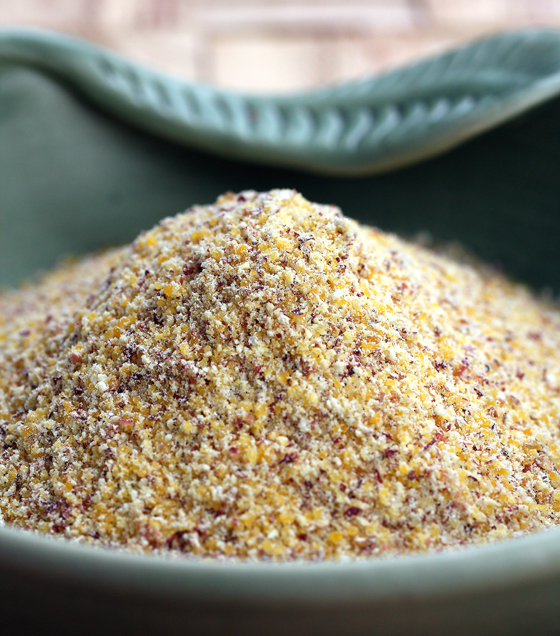 Mix in shredded onion, egg, and milk-soaked bread crumbs for added moisture. 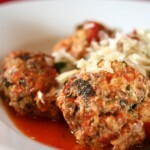 The results are juicy, fluffy meatballs perfect for nestling in pasta. Speaking of which, I used fusilli rather than the ziti called for in the recipe. 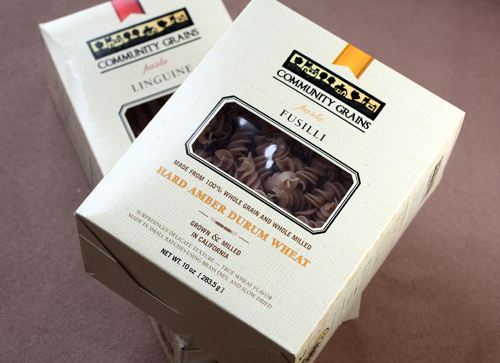 That’s because I received a sample of the new Community Grains fusilli made in small batches from 100 percent whole grain and whole milled hard amber durum wheat grown in California. If you’re unfamiliar with Community Grains, it was founded by Bob Klein, owner of Oliveto restaurant in Oakland. 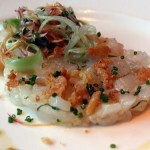 The restaurant, known for its use of local fish, meat and produce, set out to make its own pasta from local wheat, too. You can now find the dried pasta at such Bay Area stores as Draeger’s, the Pasta Shop, Bi-Rite and most Northern California Whole Foods. It’s also available online at Market Hall Foods. It retails for $7 for an 8-ounce or 10-ounce box, depending upon the variety. 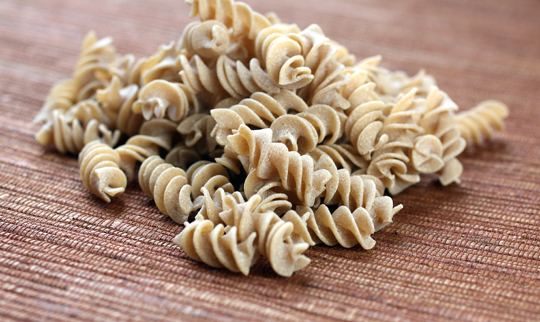 The fusilli, with its delicate wheat taste and sturdy structure, was the perfect foil for the olive oil-based sauce and the slightly bitter broccolini. 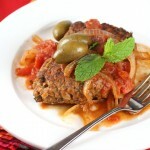 To make the meatballs, position a rack in the center of the oven and preheat to 375 degrees. Lightly oil a rimmed baking sheet. 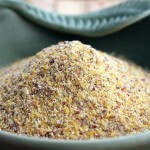 Soak bread crumbs in the milk in a medium bowl until softened, about 3 minutes. Add sausage, ground pork, onion, egg, salt and pepper and mix well to combine. Cover and refrigerate for at least 15 minutes or up to 4 hours. 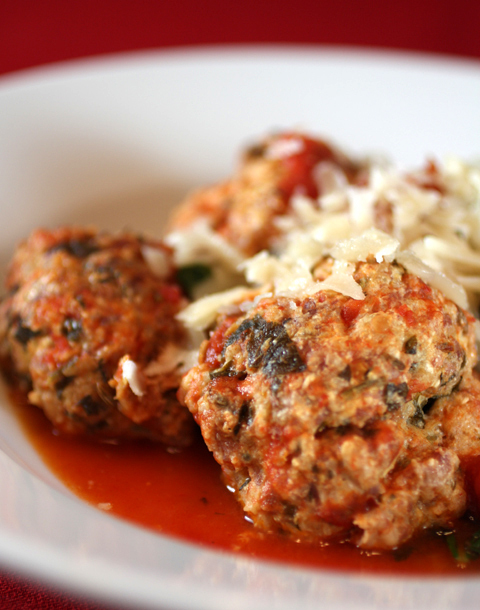 Using your wet hands rinsed under cold water, shape sausage mixture into 18 equal meatballs. Arrange on the baking sheet. Bake until browned and the meatballs are cooked through, about 30 minutes. Remove from oven. Meanwhile, bring a large pot of lightly salted water to a boil over high heat. Add ziti and cook according to the package directions until al dente. Drain well. Return ziti to the pot. While pasta is cooking, combine oil and garlic in a large skillet over medium heat. Cook, stirring often, until garlic is golden but not browned, about 2 minutes. Stir in the anchovy paste. Add broccolini and stir well. 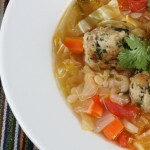 Add meatballs, broth, and hot pepper. Cover and cook, stirring occasionally, until the broccolini is tender, about 5 minutes. Add broccolini mixture to the ziti in the pot. Add Parmesan and mix well. Season with salt. Serve hot with additional Parmesan passed on the side. 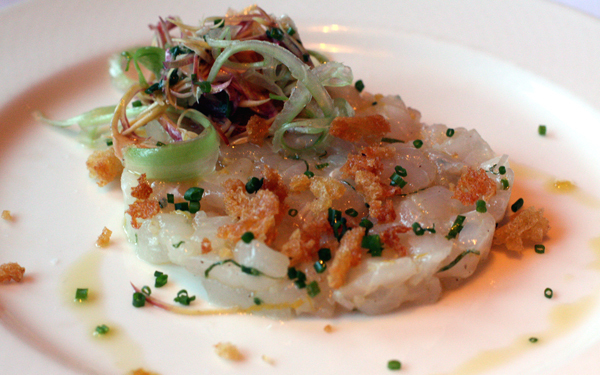 A mouthwatering dish! 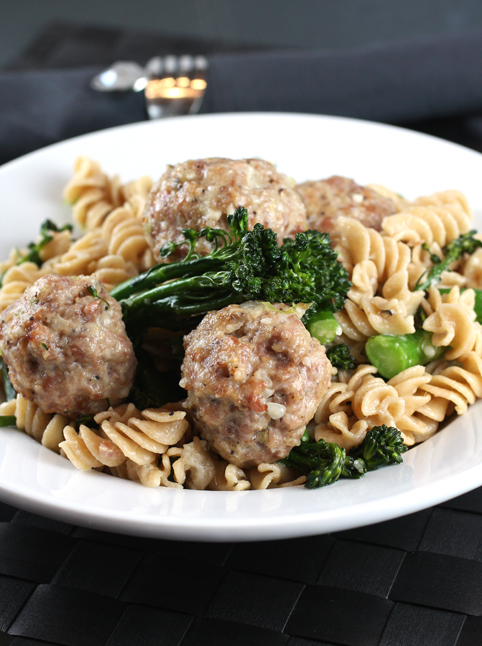 I love meatballs and whole wheat pasta. I. LOVE. MEATBALLS! I love how you make yours so perfectly round! 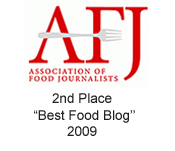 I usually just go with the traditional spaghetti, but never thought about using fusilli with broccolini. Looks hearty! You are right, i love meatballs. A real comfort food and of course pasta is my passion. These recipes looks great. Thank you for them. 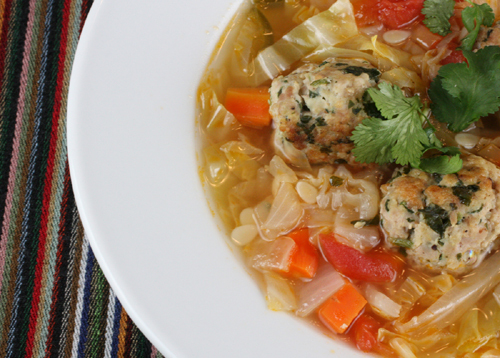 Great recipe for this rainy weather. I need to check out that pasta brand – still haven’t found a brand I like. oh gosh! I had to hold my breath in as I saw these wonderful pasta dishes! The first one definitely was a show stopper! and YES! I DO LOVE MEATBALLS!!! 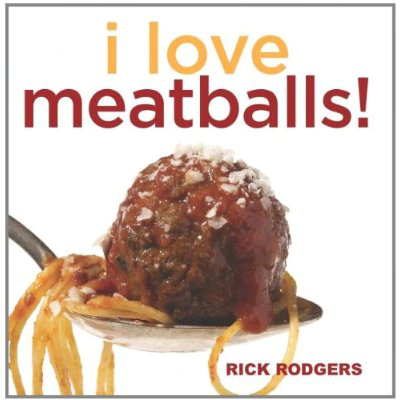 I was listening to Sirius radio (Martha Steward Channel) last week and they were talking about Rick Rodgers book and meatballs, it made me so hungry. Now looking at this I have to purchase his book. He’s always got great ideas. Thanks for sharing this. 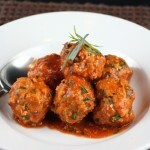 beef meatballs drowned in marinara sauce don’t do it for me, but i like the sound of sausage meatballs! 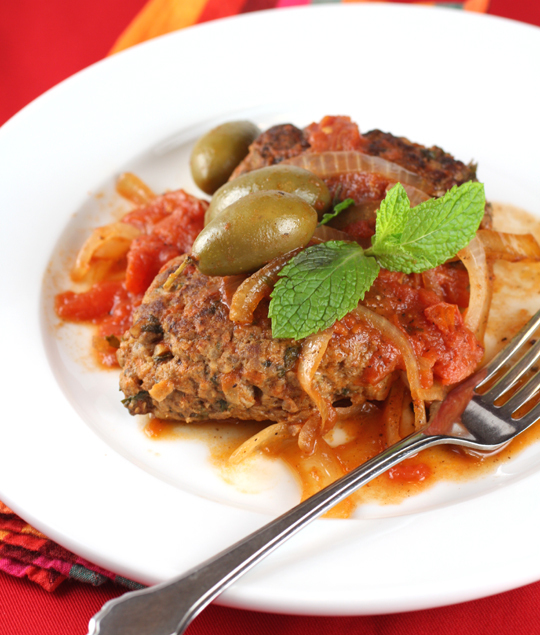 Super comforting and a wonderful mix of ingredients!